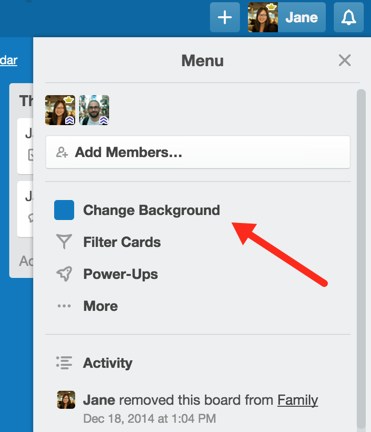 You can customize your Trello boards by changing your board's background. Once you've changed the board background, all other users that view that board will also see that same background. Choose between six different colors or beautiful photos to express yourself and also make navigating your boards page and boards drawer much easier. Trello Gold and Business Class subscribers can also upload their own background images. To change your board's background, go to the board menu on the right side of your board, and select "Change Background". You can then choose your board background. Change a board's background in the board's settings. 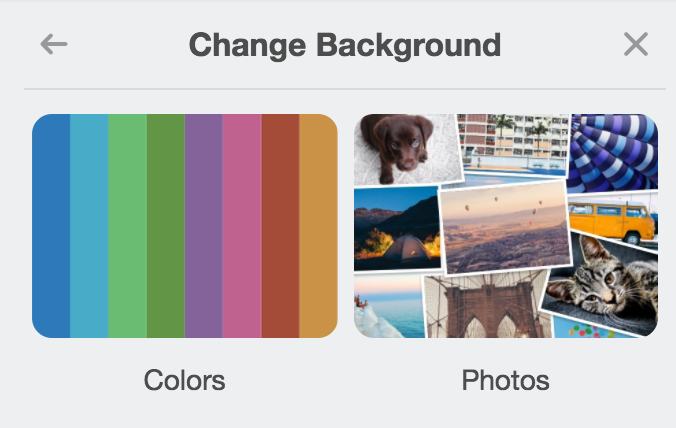 Once you've clicked on "Change Background", you'll see a new menu where you can choose between a solid color background and a photo. Select "Colors" to choose from one of our solid color options, or click "Photos" to browse through beautiful high-resolution images from Unsplash. Choose between solid color and photos. When searching for photos from Unsplash, we have a few tips to help you find what you're looking for. First, we'd recommend using single word searches. If you want to see some more results, try using synonyms or searching for related concepts (e.g., if you tried "beach", try "sand"). 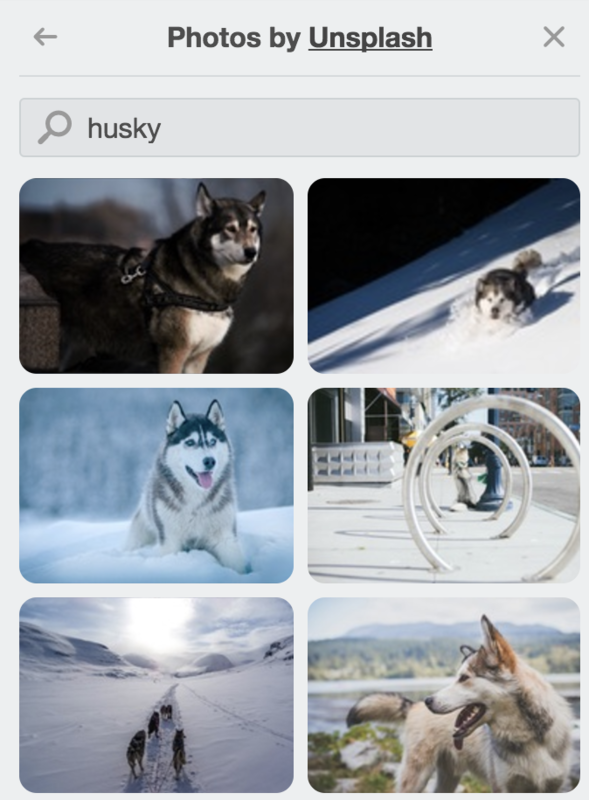 You can even find images by searching for a particular color! Once you find an image you like, click on that image to apply it to your board, and enjoy your beautiful new board background! Have fun with high-resolution background photos from Unsplash. If you miss the photo and texture backgrounds that were previously available, don't worry—you can still find them on this board. 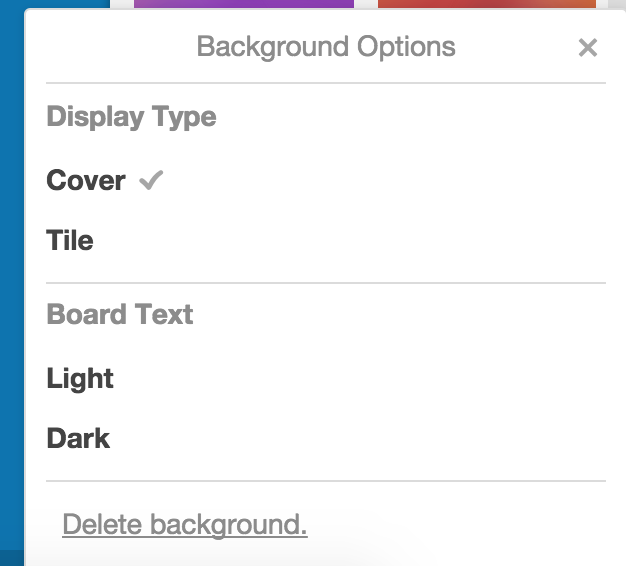 Trello Gold and Business Class subscribers can upload custom board backgrounds by clicking the grey box with a "+" sign in it located under "Custom" in the board backgrounds menu. Click the + to upload a custom board background. You can also hover over your uploaded image and click options to set how the image displays and to choose either light or dark board text depending on the color of your image. 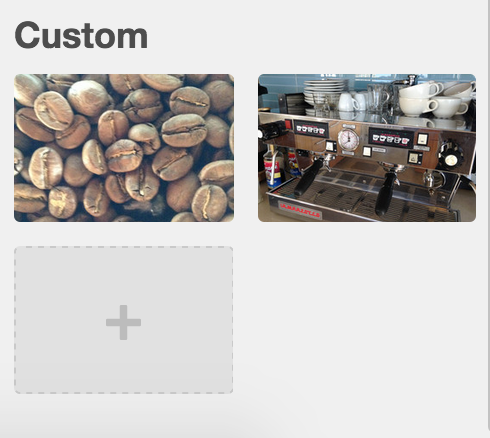 Choose how your custom board background displays. 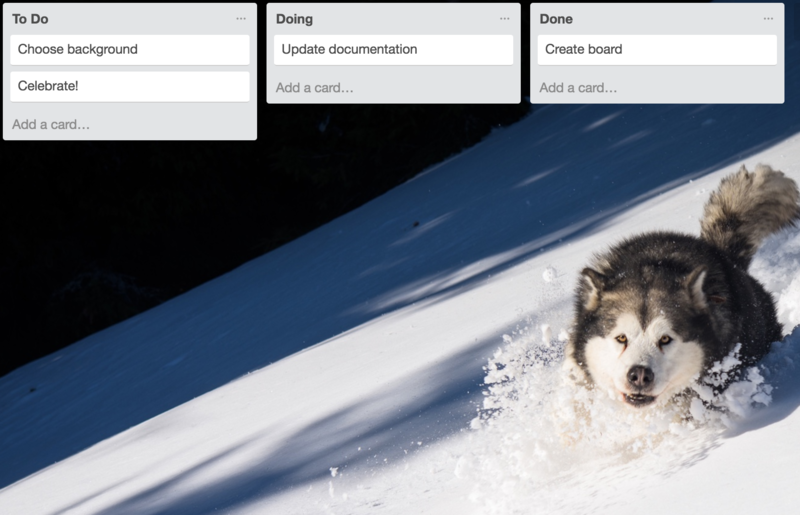 Since Trello in the browser is dynamic and the background image adjusts to the size of your browser window, there is no ideal pixel resolution for a custom board background. We recommend using a high quality image that has been taken in landscape mode (wider than it is tall) for best results.